This image may seem staged or simply a still frame taken from a super-heroine blockbuster film, yet, it is a street-photo taken with a cellphone. A daily life, out of the screen scene. 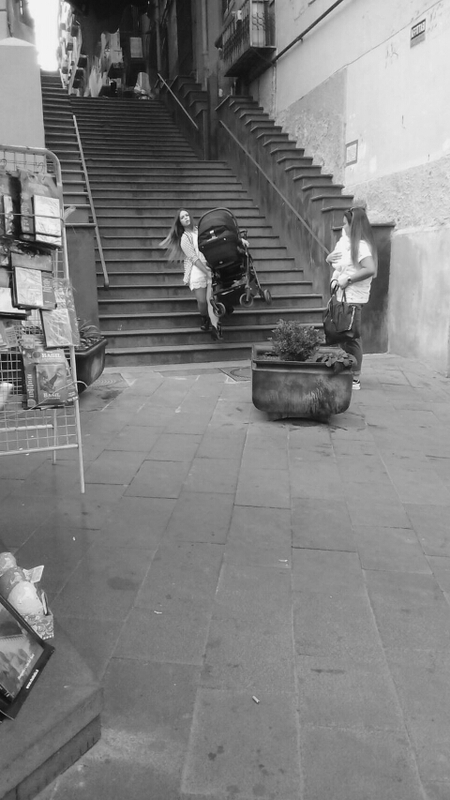 The young woman, taking the last step of what seems to be the never-ending stairway of Odessa, concentrates visually in this frozen moment, most of the tensions that permeate the making of ‘motherhood’ in everyday life of women living today both, in the city of Naples (were the image was produced) and in any other ordinary city (Robinson, 2009). In every part of the world, women are called to reconcile the demands of society and their own expectations, playing up an act of (un)balance between demands of social reproduction and personal success, other than dealing with the material implications of the need to perform such (un)balancing act. Feminist scholars and activists have long called for the unveiling of the political and material implications of power relations constructed between the private and the public spheres, between the household scale and that of the state (Fraser and Gordon, 1992). As welfare regimes constructed their provision model on the image of the male bread-winner, another tacit contract was structured through the gendered division of paid and unpaid work, normalizing the construction of the figure of waged male bread-winner and that of a female dependent care-giver (England, 2007). Through diverse arrangements of welfare provision, different countries took off pressure from women as the only care-givers, producing an uneven geography of relief from these pressures. Along with the diversified relief offered by the different Welfare Regimes (Esping-Andersen, 2013) there was also the opening of the paid working sphere to women. Still, the tensions derived from the social construction of motherhood and its material constraints continues reinforce and maintain gender inequalities everywhere. For example, up to date academic literature from diverse fields have effectively shown that there is an effective motherhood wage penalty taking place today in many countries, added to the well documented payment gap based on gender. By looking back at the image, this sociological reflection is amplified. Depicting a scene commonly lived/seen in the city of Naples, this image reminds us of the need to rematerialize the environment in which social actions take place when pursuing sociological research. The image of this young woman, Sara, who also happens to be a mother, enriches our understanding of the material (in)accessibility to the city by a person with a baby. We can’t help but to acknowledge the massive presence of the stairs, imagine the heavy weight of the trolley, accompany her in the counting of the steps and feel the empathic relief of her arrival to the end. I situate my research on this line, trying to better understand the visible and invisible mechanisms that enable or prevent women in motherhood to access the city and its resources. England, K. (2007). Welfare provision, welfare reform, welfare mothers. KCox, MLow and JRobinson (eds) Handbook of Political Geography, 141-153. Esping-Andersen, G. (2013). The three worlds of welfare capitalism: John Wiley & Sons. Fraser, N. (2009). Scales of justice: Reimagining political space in a globalizing world: Columbia University Press. 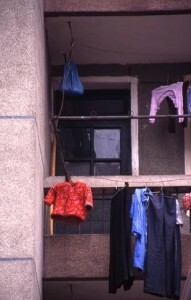 As in a multi-sited approach, this image of Chinese Laundry taken by Rachel Tanur establishes a fruitful dialogue with the image I have presented, adding important elements to further analyse the ongoing contentious tensions between the public and the private spheres and the symbolic and material repercussions these tensions have on gender, economic, and, political inequalities (among others). In Colombia we have a saying that says ‘La ropa sucia se lava en casa’ (‘Filthy linen are to be washed at home’). As important cultural markers, sayings illustrate in an essential fashion, the prevailing cultural discourses legitimized by society at large on some issues. Even though its multiple possibilities of lecture, the most basic interpretation of this saying recalls the fact that it is publicly well known that the domestic space, understood also as a hidden one, is where the caring activities take place in order to continue maintaining the public system going on as untouched (Fraser, 2014; McDowell, 1999). The image of the hanging clean clothes is familiar to all of us and in the same way the saying does, it is exactly due to its ordinariness that this image manages to be striking as read through the lenses of gender inequality and social reproduction concepts. Rachel’s image illustrates perfectly the place in the public sphere and public discourse occupied by those who do the social reproduction tasks, not only in China, but all over the world. In the image taken by Rachel, clothes are clean and ready to be wear, they have been washed and put out to dry in the outer space, yet, we do not see who did these chores. This fact invites us to problematise the making invisible of those who make possible the reproduction of life and the continuity of social life, not only in a biological sense (by reproducing), but also in an emotional and material way (by cooking, cleaning, etc.). Taking further this strand of thinking, the seminal contribution by sociologist Saskia Sassen can also help us to further analyse this invisibility process of those who carry the social reproduction at the urban scale. When conceptualising Global cities (Sassen, 1991), Sassen characterised them as a ‘dual city’. In this model, the most vulnerable actors of society perform the roles of maintenance, caring, and cleaning, doing the chores before the sun rises, and out of sight of the dynamics of the opposed pole of the dual city, one composed by high qualified jobs in the financial and creative economy. Rachel photographs are testimonies of all these tensions that remain vibrant and contentious today. They make me think of Diane Arbus’ famous quote about her teacher’s words ‘It was my teacher Lisette Model who finally made it clear to me that the more specific you are, the more general it will be’ (1972). Arbus, D., & Israel, M. (1972). Diane Arbus (p. 3). New York: Aperture. Fraser, N. (2014). Can society be commodities all the way down? Post-Polanyian reflections on capitalist crisis. Economy and Society, 43(4), 541-558. McDowell, L. (1999). Gender, identity and place: Understanding feminist geographies. U of Minnesota Press. Sassen, S. (1991). The Global City: New York. London, Tokyo, 41.